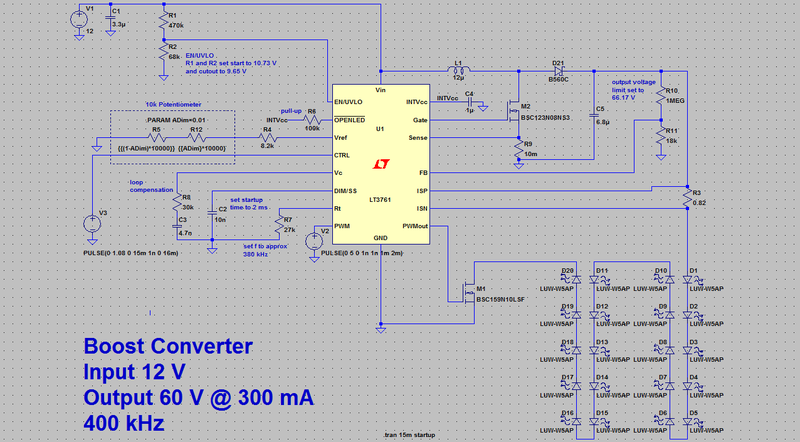 I've done a little more work on my design for a boost converter. You can catch up on my previous posts here. It's been a busy week, so I haven't managed to get a lot done, but I've have made the design more stable and experimented with ways to dim the LEDs. I've reduced the capacitor (C2) that controls the startup time from 20 to 10nF. The overshoot on startup seems to be a lot less now. Startup time is still shown on the schematic as 2 ms but it's really 1 ms. I've added two voltage sources that can control how the LED panel is dimmed. It can be done by using a PWM method or by reducing the drive current of the panel. First up I'll demonstrate the PWM method by driving the PWM pin with a square wave. You can see that the initial pulse has a little bit of overshoot but after that it's a nice stable waveform. The current though the LEDs is shown in dark blue. Not shown in this plot is a current spike when the the load is switched back on. It goes up to about 2.4A for a couple of micro seconds. From what I can tell, this is due to the junction capacitance of the LEDs charging up and shouldn't be damaging. I also think it's unlikely to happen in a real world circuit. You can see the other side of this effect in the green line which is the voltage across the LEDs, after the load is turned off the junction capacitance starts to discharge. As these are LEDs, even though there is still 40% ish of the operating voltage across them, there is essentially no current and no power, as indicated in the light blue plot. Now on to the analog dimming mode. This is controlled by applying a voltage to the CTRL pin. The current through the load is equal to (Vctrl - 0.1) / (Rled * 4) for Vctrl under 1 volt. Between 1 and 1.2 Volts this equation breaks down. When Vctrl is 1.2 V the current supplied is at a maximum and the voltage across Rled is regulated to 250mV. In my circuit this gives a maximum load current of 304 mA. I don't intend to use this control method, but you can combine the analog and digital dimming methods as shown below. To overcome the initial bump in the current waveform I tried delaying the ramp voiltage on the analog dimming method, but it didn't seem to have much effect. Once again the thing I am concerned about is the current in the inductor shown in purple below. The steady state current doesn't worry me, the peak current on start up is way too high though. I don't want to buy an inductor that's 3 times the size I need only to handle startup current. I've been playing with the simulation and I think that I can control this by controlling the voltage on the CTRL pin more carefully on startup. Essentially it needs to be ramped up slowly. Hopefully I can have this sorted by my next post, have some actual components selected, and look at laying out a PCB. As usual, you can find files associated with this project on the Github repository.